In a large bowl, combine the pork, sugar, wine, soy sauce, 2 tsp chopped green onion and ginger. Blend well, and let stand for 25 to 30 minutes. Sauté the pork over medium-high heat until browned. Place about 1 tsp of the pork filling at the center of each wonton skin. Moisten all 4 edges of the wonton wrapper with water, then fold each corner into the center and pinch edges together firmly to make a seal. Continue until all wrappers are used. Heat the vegetable oil over medium-high heat (to 375F) in a pot and fry wontons in batches. Let the wontons cool on paper towels after frying. Bring the chicken stock, ⅛ cup green onions, sugar snap peas and carrots to a rolling boil. Let simmer for 10 minutes. 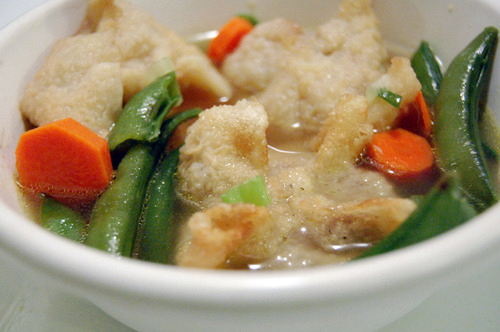 Serve soup topped with wontons.